Laloux’ must-read (or should-have-read-by-now; it’s a 2014 publication) is what it claims to be: A guide to creating organisations inspired by the next stage of human consciousness. 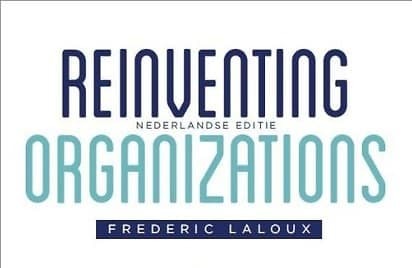 Studying organisations worldwide that independently explored new paradigms, structures and practices, Laloux finds that these frontrunners are remarkable similar in key aspects. To mention one key: In teal organisations (in case you are as ignorant as I was, “teal” is a light blue shade – and this refers to a colour coding of evolutionary models of human interaction) – in teal organisations nobody tells anybody else what to do. The organisations work in self-managing teams, in which every member has the right to take decisions, including the spending of money, without seeking anybody else’s approval. Huh, how could that work? Well the deal is that you talk to at least two key players. You don’t have to follow their advise, but you have to seek dialogue. And everybody is committed to seek and engage in dialogue when there is tension and disagreement. Rather than pre-emptying disagreements by rules and hierarchy, teal organisations have a procedure how to face them. When any two people disagree and don’t find a way out, they call for witnesses, often higher managers, but purely to mediate rather than to judge and decide. That’s it! That’s the recipe! And it works if colleagues deeply trust themselves and each other – which they do incrementally as they familiarise and love the new paradigm and workplace. Paradoxically teal organisations have one condition for success: That the leadership believes and keeps to this vision. Some teal organisations have been killed by interfering investors and boards who loathed the seeming anarchy. So the twist here is that hierarchy is eradicated as the decision-making principle, at the condition that the top of the hierarchy consistently and passionately lives a teal vision. I personally love the book for this insight in leadership, which could be overlooked as an afterthought at page 250 and next. While at Perspectivity I sometimes sense an aversion for hierarchy, these pages show the key role of leaders in holding space to unleash the best passion and wisdom.